As part of this, the Special Committee on road decongestion assigned to ensure that trucks/trailers are not blocking the access roads will be brought back. This was among the agreement which the federal government reached with the Maritime Workers Union (MWUN), as condition to suspend their planned strike. The Labour Minister, Dr. Chris Ngige had reached the agreement with the Union and the Ministry of Transportation, Federal Ministry Power, Works and Housing and the management of the Nigerian Ports Authority (NPA) Tuesday which led to the suspension of the strike. During the meeting the workers expressed concern about the slow pace of work on the road, and called on the contractor to speed up work. 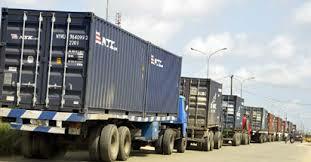 The Union also called on the federal government to discourage further establishment of new tank farms in port areas. Another measure pointed out was for collaboration between the federal government and the concessionaires to ensure movement of containers by rail to check congestion in the port. The meeting also called for more serious effort in the completion of trailer park project where the trucks and trailers can be accommodated. “The collaborative efforts of Federal Ministry of Transport through the NPA, FMWP&H, Dangote Limited and Flour Mills on the two (2) Km Wharf road is noted. However, these efforts have not been very appreciable as only 10% of the work has been done till date. The meeting therefore called on the lead project company; Dangote to speed up action in terms of galvanizing human and material resources to see that they meet the timeline of the completion of the project in spite of unforeseen challenges; The Federal Government to pursue vigorously the policy of non- establishment of new Tank Farms in the Port areas. ” The sanitary conditions of the surrounding and roads to the Ports should be the Social Corporate Responsibility (CSR) of the NPA and the Authority should do the needful to remove the refuse within 3 months to avoid endangering the lives of workers and Port users.